The Sanctuary was established in October 1961 and was renamed to Indira Gandhi Wildlife Sanctuary after visiting the former Prime Minister Indira Gandhi. The sanctuary covers an area about 841.49 sq Km and about 117 sq km area was declared as the national park in the year 1989. Many places of natural and scenic beauty is present in the park. some of them are : Grass hills, Karianshola, Anaikunthi Shola, groves, waterfalls, teak forests, reservoirs and dams. The park was declared as Tiger Reserve Sanctuary in the Year 2010 by the National Tiger Conservation Authority. For 1st time trekking the Annamalai hills is the ideal place. Large tracts of plateau were under the intense plantation of tea and coffee after the deforestation of natural forest. The area came under the Tamil Nadu Forest Management in the year 1855 for the plantation of teak. Two-third part of plantation were owned by the Europeons and rest were owned by the Indians from coastal towns. Under the Bombay Presidency this part of western ghats were exploited for teak which supplies to bombay dockyard for shipbuilding and later for railroad ties.The Park and the Sanctuary is under consideration by UNESCO. Tourists can visit Indira Gandhi Wildlife Sanctuary is from December - April as the weather is pleasant and has a good chance to sight wild animals in their natural habitat. In the months from March to October temperature ranges from 14°C to 35°C. In the months from November to February temperature ranges from 6°C to 24°C. 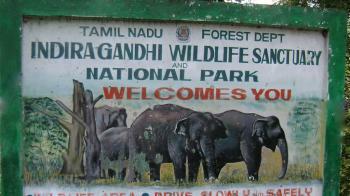 By Air - Nearest airport is Coimbatore Airport to connect to Indira Gandhi Wildlife Sanctuary . By Rail - Nearest railway station is Pollachi Railway Station. By Road - Indira Gandhi Wildlife Sanctuary is accessible by road through public buses and other modes of transport.